The Sunday Intertitle: Anti Bellum! Thursday evening was wild — we’d booked seats for Buster Keaton’s OUR HOSPITALITY at the historic Cameo Cinema (as featured in Chomet’s THE ILLUSIONIST) at 7, and then belatedly found out that, after initially being rejected, we had, after all, been granted free tickets (as part of a promotion for Grolsch beer and Little White Lies magazine) free tickets to see SCOTT PILGRIM VS THE WORLD, at 8. Depending on projection speed, OUR HOSPITALITY is about an hour and ten minutes long. It looked dicey. Fortunately, I realized that both films were playing in the same auditorium, so unless they intended to project the first ten minutes of SCOTT P on top of the last ten minutes of OUR HOSPITALITY, it looked like we were OK. And while, yes, I agree that would have been interesting, I’m glad they adopted the more traditional one-film-at-a-time approach. Neil Brand on the piano — live! Fully amplified, and making a dramatic racket to simulate the onscreen thunderstorm in Scene One. I’ve seen solo piano accompaniments before, but none as effective as this at the serious bits. I once saw NOSFERATU with a pianist who made it seem funny and quaint with his tinkly counterpoint, and wondered whether a single instrument could do justice to a more serious tale. Now I’m itching to hear Brand’s take on Murnau. This was ideal musical treatment, melodic at times, percussive at others, standing in for absent sound effects but in a discreet and elegant way. With the Edinburgh Festival raging outside, the audience wasn’t as big as I’d have liked, but the laughter still resounded at these eighty-year-old gags. Fortunately, despite the film’s deep south setting, Keaton eschews the racial caricaturing endemic to films of the time, so there’s nothing to greatly embarrass amid the pleasure. A joke about domestic violence (Buster intervenes to protect a battered wife, and she furiously drives him off with heavy blows, before proudly surrendering to her husband’s brutality once more) is certainly non-PC, but contains an uncomfortable kernel of psychological veracity. I hadn’t actually seen a 35mm projection of this, Keaton’s second feature as (co-)director. My first big-screen viewing of SHERLOCK JNR had allowed me to appreciate the fine ensemble playing more (on TV, Keaton completely dominates). Since everyone save Keaton and a couple of locomotive workers (one played by Joe Keaton, Buster’s dad, athletically kicking hats off tall men’s heads — a trick that once rendered Buster unconscious) is played straight here, that wasn’t the revelation this time, although I appreciated Natalie Talmadge (Keaton’s real-life wife) a little more. What came over were the production design details, like the little brushes affixed to the front of the train (a working copy of Stephenson’s Rocket) to clear small obstacles from the track, which incidentally is also Henry Fonda’s job description in ONCE UPON A TIME IN THE WEST. What was also noticeable was the storytelling style, which isn’t as refined as it would later become. While it’s fascinating to see Keaton shoot the melodramatic opening in a serious manner, he hasn’t quite reached the minimalist perfection of his coverage of THE GENERAL. Richard Lester said of that film, “You can’t take a single thing from it.” Every shot is absolutely essential to the scene it’s in, and every scene essential to the plot. This theoretically means that if a single shot hadn’t worked, the film would be fatally flawed… based on this assessment, THE GENERAL may be one of the very few objectively perfect films, in terms of construction at least. OUR HOSPITALITY doesn’t aim for such economy and precision. When Natalie is introduced, her dog, who has no narrative function whatsoever, gets a length closeup. 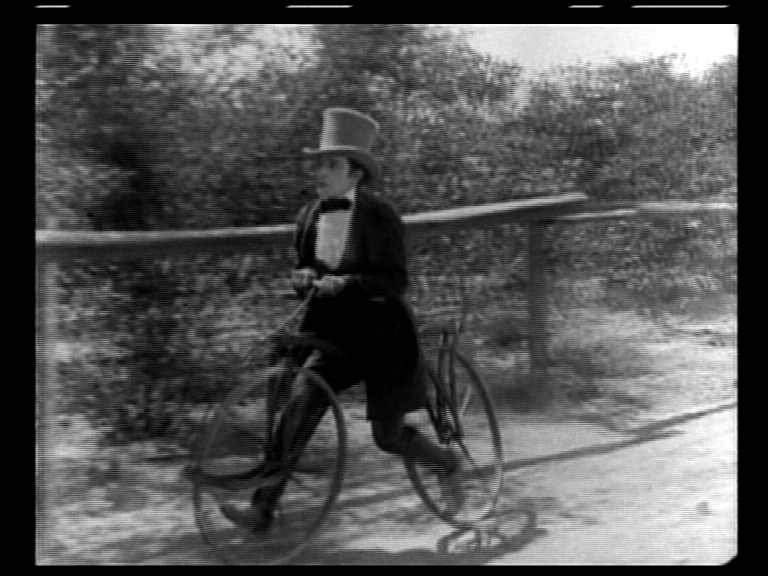 When Buster goes for a ride on his bike, there are numerous shots of him running along astride it. The later Keaton would have settle for one. But these “flaws” are so charming they can hardly be objected to. They merely characterise the film as a more loose and rough-edged production than the “so real it hurts” detail of THE GENERAL. This entry was posted on August 22, 2010 at 10:00 am and is filed under FILM with tags Buster Keaton, Joe Keaton, Natalie Talmadge, Neil Brand, Our Hospitality, Scott Pilgrim Vs The World, Sylvain Chomet, The Cameo, The General, The Illusionist. You can follow any responses to this entry through the RSS 2.0 feed. You can leave a response, or trackback from your own site. I like OUR HOSPITALITY because it shows that Keaton’s kind of comedy isn’t necessarily about making people laugh. What I love is the recreation of period detail and the old rural landscape which he shoots very well. 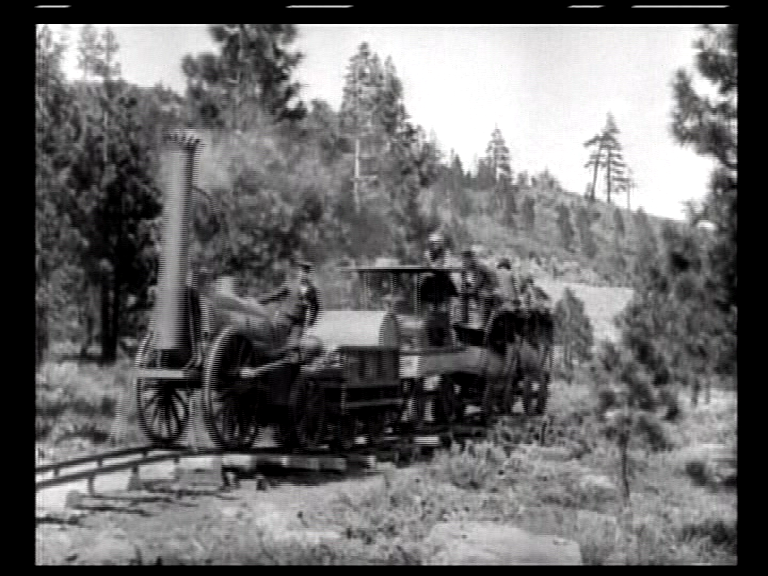 The scene with the Stephenson’s Rocket(an exact working replica) is what the film’s interest is in. I have to say, I like the melodramatic Keaton films like ”Our Hospitality” and ”Steamboat Bill, Jr.” more than ”The General” while ”The Cameraman”(undervalued because it was made at MGM, the studio that destroyed his career) is my overall favourite. As is often the case, the clever plot motor of Our Hospitality, putting together two things everybody knows about the south, the blood feuds and the hospitality, only gets Keaton through about ten minutes of the film, clever though it is as an idea. And the great stuff is what spins off from it. The train sequence is brilliantly sustained, way too long by any “structural” criterion, but giving a sense of how long travel took, and superbly entertaining as a journey with jokes rather than as narrative. I really like the film’s vision of New York also. The Cameraman has a few sequences I don’t particularly like, notably the changing room scene, which just feels sore. But I bet a big-screen viewing would be some kind of revelation. Sherlock Jnr is one of a kind and a great film, The General is probably at the top of my list, but The Navigator is right there too. The new release of Steamboat Bill Jnr is a good excuse for me to revisit that one. Keaton wants you to look at things first and then find them funny. Hie aims for the droll rather than the uproarious. And yet, if you get a big enough audience together, the effect is pretty loud! Our crowd was disappointingly sparse, but one sequence in particular, the series of falls off cliff faces by two men bound together by a long rope, each yanking the other from his perch in turn, got them HYSTERICAL. I first saw that scene on an old daytime chat show where the actor Donald Sinden chose it as a favourite movie. And he demanded they show that bit TWICE because he enjoyed it so much. I think the show was live, because they had to rewind the tape and it was a really big deal! Backward ran the intertitle until unreeled the mind. The accompaniment being important is something I got a taste of years ago watching Keaton’s Go West. One score I heard dried out the pathos a good deal, and I liked the film better for it. I can see how a bunch of violins might overbalance that in Go West though. That’s Keaton’s ethos, he never asks the audience to like his character but they like him nevertheless. The finale of GO WEST with the cows invading the city is a great set piece even if the film isn’t necessarily his most interesting. The stampede is astonishing and trippy. I think Keaton carefully constructs his stories so you’re forced to root for his character, and he earns your affection and respect, but he religiously avoided character touches that might appear to be special pleading. Like the moment in Sternberg’s Underworld that so disgusted Ben Hecht: the hero giving milk to a kitten to show he’s a nice guy at heart. Included by Sternberg with the greatest possible cynicism, you may be sure. I’d put THREE AGES over the rest of the second tier at the lowest step of the first. I love that movie a lot. Very impressive spoof of INTOLERANCE. A lot of Keaton’s set pieces transcend his movies. Like I’m no fan of 7 CHANCES but there’s nothing in silent cinema to compare to the “wandering rocks” sequence. I think what a lot of the silent comedians faced when moving from the comedy short to the feature is finding a narrative interest around the set-pieces, even in his shorts Keaton had that problem, like the best part of THE PLAYHOUSE is the opening dream-scene which Keaton felt he ought to have carried for the rest of the feature but backed away because he didn’t want to show-off that “he could play everyone in a movie”. He regretted that later on. Keaton’s impersonation of the monkey is UNCANNY, though. So I can’t regret his “mistake”. That movie is dreamlike even after the dream ends, especially when the stage crew dismantle his room. Three Ages has structural daring and some excellent gags, so yes, it’s high in the second tier. And Seven Chances has lots of little grace notes on the way to the climax. Several of the proposals are hilarious, and Keaton is fine casting for such a situation. And I like the wife stampede, which renders a misogynist nightmare in hilarious terms. Yeah, I would have hated to see that dispossession gag go. Love that Train..Its so toy like ..its like you could just lay down the Track ahead of you as you went along. My favorite Piano playing movie theatre experiance,was in ’91 at the AFI festival here on the night of the Hal Roach tribute.I sat behind author William K Everson,who played the piano for some Lloyd and Charley Chase silents,with Roach himself and George “Spanky” McFarland in attendance. Joe Keaton as the engineer steals the show, as Buster knew he would. The Hal Roach tribute sounds superb. There was a man who knew how to live… and go on living! My most memorable screening of Our Hospitality was at Royal Festival Hall in October 2006 when, as part of his 70th birthday celebrations, Carl Davis conducted the London Philharmonic playing his own score to the film. I still remember the gasp that greeted Buster’s leap across the waterfall to rescue Natalie. Sadly, I had to miss the show at the Cameo, but my fellow members of The Frozen North, a group of Edinburgh-based Keaton fans, were all there. They came across Neil Brand in the Cameo bar and, I gather, ended up having a convivial time with him, both before and after the screening. I interviewed him a couple of years ago and he’s a lovely man. Great to hear his regular slot these days on Radio 4’s Film Programme. Our Hospitality remains my favourite Keaton feature. Not because it’s his greatest film – although it has many fine things in it – but because of its sweetness and innocence. He made it at the age of 28 with all his family around him (three generations appear in it) and before things started to go wrong in his marriage. Davis’s scores for Our Hospitality and The General are magnificent, the best accompaniment to Keaton I’ve encountered. I’m impressed by the way he stresses the epic qualities without overwhelming the wit or producing any sense of heaviness. You’re right that OH is one of Keaton’s happiest films. Although I quite like it when his humour turns grim. After all, I blatantly stole the ending of Cops for my own Cry For Bobo. Super! I’m impressed that we owe this invention to a volcano, and the subsequent horse-eating. And what happened to the train? He loaned it to Roscoe Arbuckle and Al St John for ‘The Iron Mule (1925). Don’t know what happened to it after that.